Reset and Unwind at Malumpati Health Spring - Choose Philippines. Find. Discover. Share. Simply known as Malumpati, the health spring and tourist resort is a popular Eco-tourism spot that feature cold-spring pools in a rich tropical forest. The resort is located at Pandan, Antique and operates daily between 7:30am to 4:00pm. The name “Malumpati” is derived from a local phrase “malumpat ang ati” which roughly translated to “aetas will jump.” Atis is one of the indigenous people (IP) groups in Panay island. 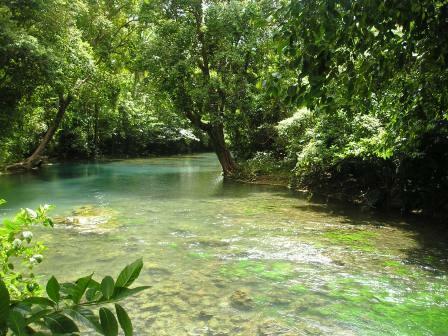 According to local stories, when the spring is still unknown to many Ati people used to take a bath and jump in its clean and crystal clear blue waters. Thus, the place is known as Malumpati. For accommodation, you have an option if you want to just stay for the day or an overnight stay to have a complete experience of the spring. Depending on the size, cottages for day tour varies from Php200 to Php500. You can also camp for free if you opt to bring your own tent. For overnight stays, there are huts or rooms good for 4 persons ranging between Php1200 to Php1800. Aside from simply swimming in its pristine cool waters you can enjoy your water tubing experience for only Php200 per head. The fee already includes a guide and safety gears such as life-vest, helmet and tube. Even Ryan Bang didn’t pass up the chance of experiencing the summer craze last March 2018. You can also go on a trek at Php200 only for 5 persons with 1 guide. And, if ever you get hungry and haven’t brought any food there’s a restaurant in the area that offers affordable meals! For inquiries, contact Malumpati Health Spring and Tourist Resort at (+63) 908-566-5256 or 0909-032-2319. From the Iloilo Airport, you can take a shuttle (Php120++, one way, one hour) going to San Pedro, Molo Terminal. From the terminal, you can take a bus or van to Pandan (Php250++, one way, 5 hours). Then from Pandan town proper, you need to ride a tricycle (Php50 per head, one way, 15 minutes) to reach Malumpati. If you come from Kalibo, Aklan going to Pandan will take you more than an hour of land travel. If from Caticlan, Aklan it will only take you around 45 minutes land travel going to Pandan.